Circle Time. Morning Time. Morning Basket Time. In our home we call it Brain Training Time. 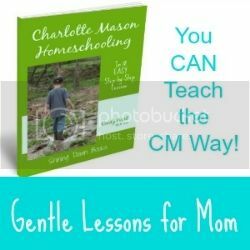 Whatever you might call it, I have some great ideas to help you include nature study during the time you gather for family learning before jumping into the rest of your homeschool day. I bet you think I’m going to tell you that circle time should begin with a quick nature walk. Nope. While that’s certainly a great way to start your day, in this article I’m actually going to share ideas for nature study without going outside! And, since we’re talking circle time and I know you’re probably including more than one activity each day, all these ideas are meant to last no more than five or so minutes! How’s that for efficiency? Note that a complete study of nature cannot take place strictly indoors in five or so minutes a day, so these ideas should be considered supplemental to frequent nature walks and in depth nature study. 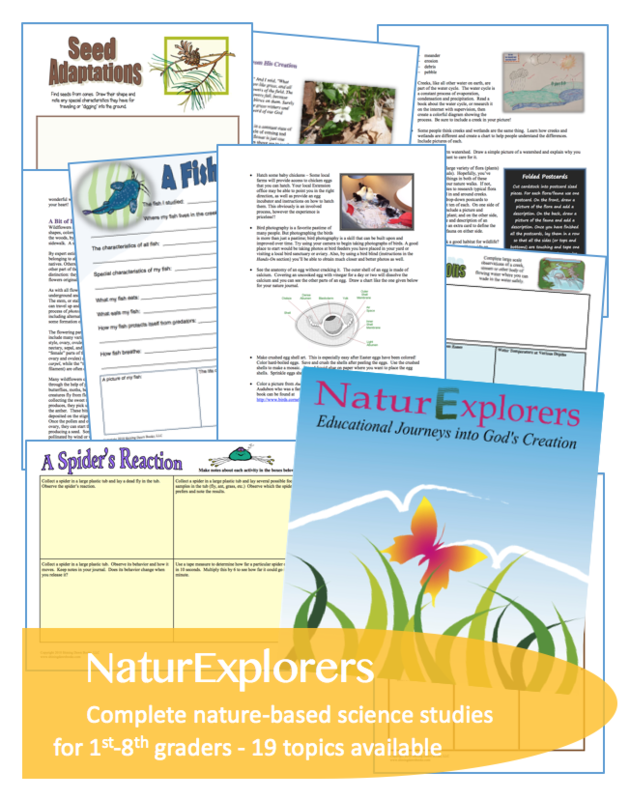 If you need ideas to make that happen, I know you’ll love the NaturExplorers series! On to the circle time activity ideas. Enjoy your family time together! Everyone sketches the item in a nature notebook. Label parts and/or write a sentence or two about the item. Take turns observing the item (with the naked eye or with a magnifying glass) and discuss the observations as a group. Challenge everyone to use various sources (field guides or the internet) to be the first to identify the item. Take just a few minutes to learn about one new thing from a field guide or the Handbook of Nature Study. Mom can read aloud or kids can pre-read and teach facts to the rest of the family. This is a great activity to do before an upcoming nature walk where you’ll be observing something specific – or after you’ve been on a nature walk and need to learn more about something you observed. 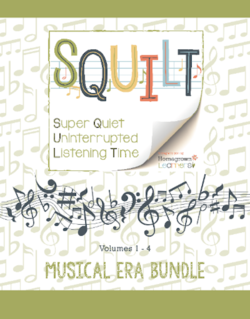 Whether it’s a wonderful picture book, a chapter from a Christian Liberty Nature Reader or a chapter from a Thornton Burgess book, living literature is never a waste of time – and sharing a book together is a great circle time activity. There are so many nature items that would be nice to identify by sight when in the field. These fun identification ideas utilize simple printables from the internet or prepared nature flashcards (seen below.) While you can certainly use the images for flashcard drills, you can also play matching games, memory games and go-fish style games. Additionally, you can sort (categorize) the images into groups – which could also be graphed. For some of the suggested games above – like memory, you might need more than one set of cards if duplicates aren’t already included. ***Fandex Field Guides could be used as flashcards or taken apart to use in sorting activities, too. Introduce a new nature vocabulary word or two during each session. 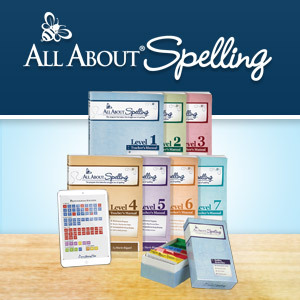 Write each new word on an index card and review the stack occasionally. Where do you get nature vocabulary ideas? Anywhere – common or scientific names of nature items, geography terms, and words the describe nature (ie. growth, rapids, erosion, pollination.) Work on vocabulary that has to do with your current nature walk focus when possible. Many of you are already doing calendar time with your families each morning. Why not add a daily nature focus to calendar time? A bulletin board style calendar is just fine, but I prefer printable monthly calendars so each child has his or her own copy to make daily nature notes. The basic plan is to make daily observations from a window or the front porch and note what you see on the calendar. You can let your children note whatever they like about the day – the weather, a bug that just flew by, a bird at the feeder, etc. You can rotate through five or ten items of observation. For example, Mondays you note the weather, Tuesdays you note the front yard tree, Wednesdays you note the birds, Thursdays you measure the sun’s shadow to note and Fridays you note the flowers in your yard. Rotating the daily topics allows for seasonal observation that equals pretty powerful learning. We don’t usually complete copywork during morning time, but I’ll often use lines from the current poetry as copywork during the week. This activity is similar to the table observation activity mentioned above, but its purpose is not so much in learning about the nature object as it is to use the nature object as the “model” for practicing art skills. I usually focus on one particular art skill for the day – like shading, cross-hatching, movement, color, shape, etc. After demonstrating the skill, I’ll place a nature item in the middle of the table and ask my children to draw the item while practicing the art skill. Of course, there is an incredible amount of attention to detail that must be practiced during this time, so nature observation is happening – even if not explicitly discussed. We call our morning time “Brain Training” time for a reason. I like to wake up tired brains in the morning with activities that fire up the brain and build neuron connections. Activities that build memory, speed, attention and critical thinking all serve as morning exercises for the brain and strengthen my children’s abilities in all areas of learning for the day ahead. 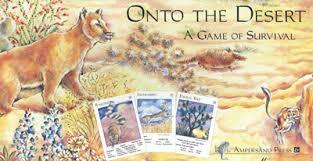 Games are a fantastic way to train the brain! We play at least one brain training game every morning and I make sure at least one morning a week we are playing a nature-related game. These are our favorites so far. Another of our favorites is Shanleya’s Quest: A Card Game. I’m not a fan of the book of the same title, but it seems as if there may be no other way to purchase the card game without also buying the book. Boo. After morning time, I snuggle on the couch with my little guy for his read aloud time. 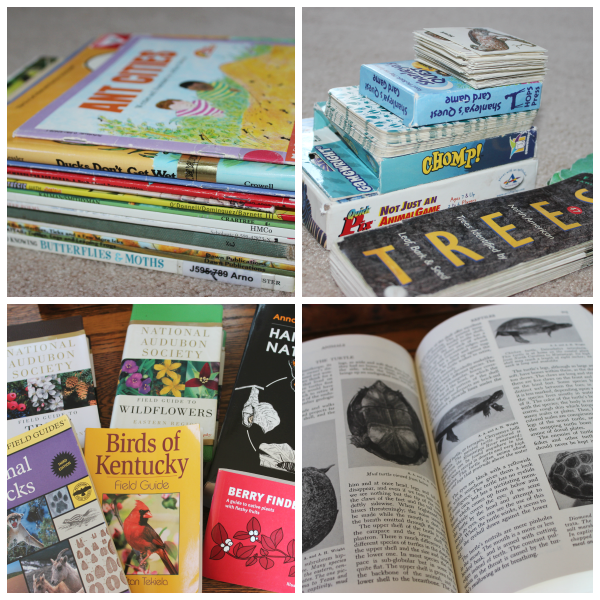 He reads from all sorts of books, but I’ve recently come across a fun nature reader series from DK. They come in various beginning reader levels and make a great transition into schoolwork on the days we do nature study during morning time. And there you have it! 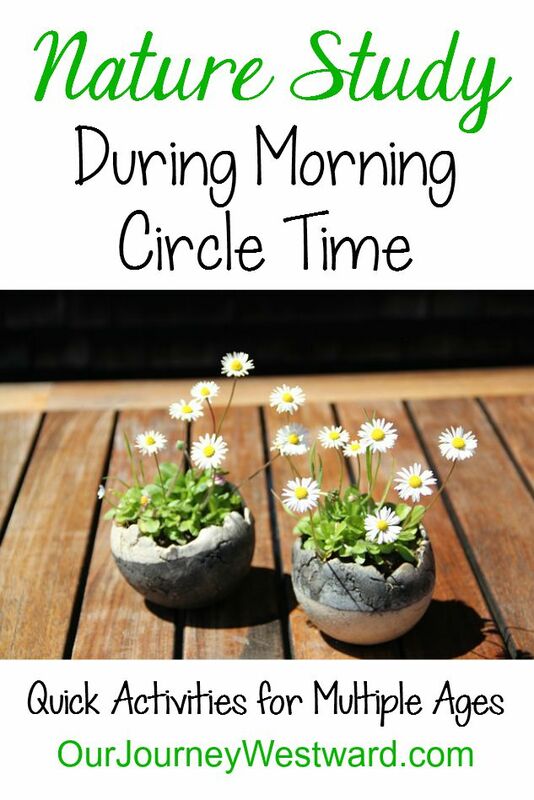 Fast and easy activities for multiple ages to include nature study in your family’s morning circle time. 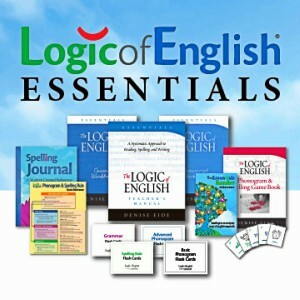 Have fun and learn lots! 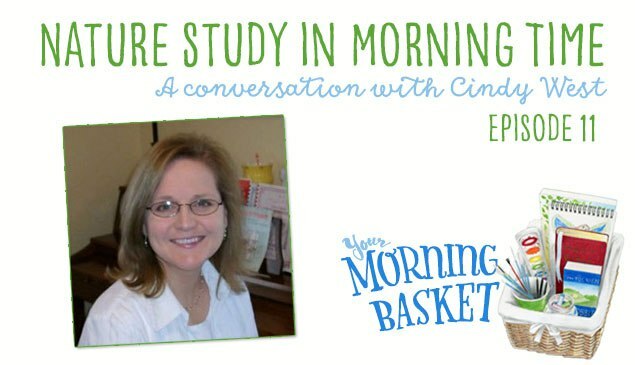 If you’ve enjoyed this post, I know you’ll want to hear the Your Morning Basket podcast I did with my friend, Pam Barnhill. We had such a good time talking about many of these ideas! One of my favorite posts, I read it over and over for new ideas! Thanks for sharing. I couldn’t have found this post at a better rime, thank you so much for the ideas so simple and work for both my kids who have a huge age gap…I can’t wait to start!!! Thank you. Can I only buy your book from you. Or is there anywhere else I can buy it? If I buy it from you, do you still have a copy and how fast can I get it? 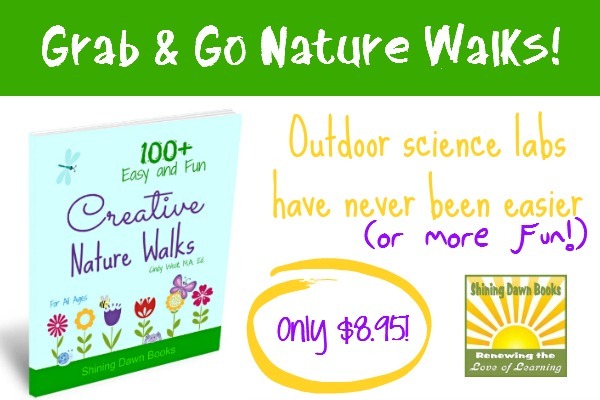 Hi Cathy, you can find 100+ Creative Nature Walks at https://ourjourneywestward.com/downloads/creative-nature-walks/. 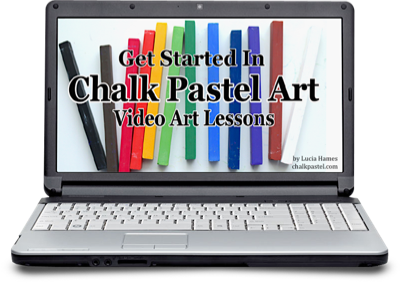 It is only offered through my website, but since it’s a digital file, you will gain immediate access to it upon purchase. 🙂 Please let me know if you have any other questions! 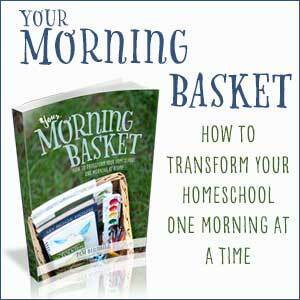 This is one of my favorite podcasts from Your Morning Basket series! Thank you for such a wealth of resources and ideas for nurturing the love of nature in my children! Oh, my goodness! You just brought a huge smile to my face. :o) Thanks for taking time to share that encouragement with me. It goes a long way in inspiring me to keep on keeping on!